The best kitchen faucet doesn’t have to be expensive – not if you know what to expect out of a top-notch model. Introducing Fapully, a spray bushed, pull down kitchen faucet with a five-star functionality to rival that of high-end models. Here’s a critical view of this model and what makes it blink when pitted against other units in its category. The Fapully may be on the affordable scale of the spectrum, but it doesn’t fall short when it comes to what it can do. It flaunts a hard wearing body to handle the demands of everyday use. More specifically, this unit features an all-metal body complete with a rust resistant handle. Add the heavy duty spring, and the iconic grade ceramic cartridge and what you get is a kitchen faucet that can withstand up to 500,000 close and open test. Now, that’s what we like to call value for money right there! Apart from the outstanding design, the other thing that makes this faucet such an attractive option is the excellent functionality it brings to the fore. It touts a one-function sprayer to allow you to rinse your pans, and plates quickly. It also has a separate spout to enable you to fill your pots in a breeze. You may also want to know that the stream spout and the spray head can rotate at 360 degrees so you can have full access to your sink. On top of that, the pre-rinse feature provides high pressure while saving still enabling you to conserve water. What’s more? The spout has a height of 18.8 centimeters to offer enough room for your pots and pans. For those asking, the hose has a length of 60 centimeters while the spout reaches an impressive 21.5 centimeters. So versatile is the Fapully that those who’ve used it say it can handle any kitchen task you throw at it. No one will tell you this, but for you to make the most out of your faucet, you must have full control over it. The Fapully has a strategically placed single handle that allows you to fiddle with the water pressure and temperature conveniently. Fans applaud the smooth swivel action combined with the simple pull down to let you use your faucet efficiently. Besides, the sprayer docks securely when you’re not using the faucet. Meanwhile, the sprayer’s lock design allows you to free your hands when washing dishes. The Fapully Pull Down Kitchen Sink Faucet is as trendy as they come. It boasts a contemporary industrial feel so you can bet it’ll make a beautiful addition to your kitchen. 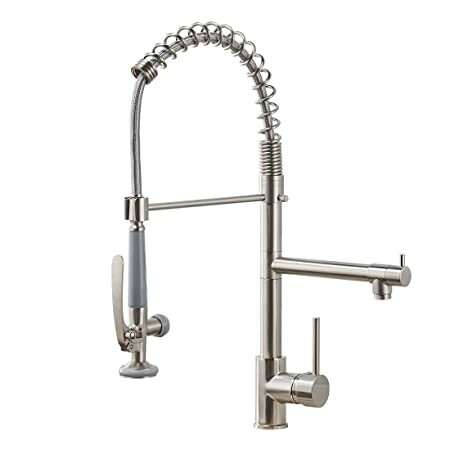 The perfect mix of stylish appeal and eye-catching finish, as well as the high arc, will turn this faucet into a focal point of your cooking place. It doesn’t take a lot of work to maintain this faucet. The nozzles require a few wiping to prevent mineral build-up. Also, the built-in ceramic cartridge ensures drip-free operation. By extension, this means that you can keep the Fapully looking as good as new as long as you clean it after a few uses. Besides, the superior corrosion resistant finish is an added advantage when it comes to maintenance. The Fapully Commercial Pull Down Kitchen Sink Faucet may be a relatively new entrant into the market but is already turning out to be a crowd favorite. It is an excellent choice for anyone scouting for a faucet that will get the job done without spending too much. As stated, it makes a perfect fit for a busy kitchen or restaurant with a lot of filling and dishwashing to do. And the beauty of it is that it guarantees to last for months upon months, so you count on it time and again. Be sure to grab this faucet; there is a reason previous users think of it so highly. I need to replace the two o rings in the sprayer.How can I order them? I would like a visible replacement of the parts?